Living 25 years in Kaokoland gives one a certain insight that would not have been acquired in any other way. And so my story and knowledge of Ndjinaa starts 20 years ago. From the beginning I made a point of getting to know chief Kapika who is the Himba headman of the area. Once, while visiting chief Kapika at his Omuramba (kraal) I noticed her. She wasn’t allowed near visitors but from time to time I caught a glimpse of her. As the years crawled on and I became more familiar with the inner workings of the Omuramba, I got to see a bit more of her – but always at a distance. I tried to enquire about her, but did not learn much. I knew something was wrong, but not having enough knowledge about the Himba, I could not put my finger on it. I did not give up on her and I kept on trying to get closer to her. I was told that she was bewitched and should stay away. Although she could not speak coherently, I knew that she wasn’t mad. Through her eyes I could literally see her soul. The wires and chains bounding her to whatever post the Himba could find could not break her spirit. Beneath the filth and dirt, the true woman was lurking; waiting. But my lack of knowledge prevented me from intervening. I simply had no idea what was wrong. Too make matters more delicate, she was the sister of chief Kapika. I did not want to strain the very sensitive relationship between us. I only knew that everyone in the village was afraid of her and that they avoided her at all cost. I also knew that she was fed like a dog with only a bit of water and food. In days of draught, she was the last one to be fed. The years passed and then my path crossed with Berrie Holtzhausen – an old school friend of mine from back in the seventies. I had no idea that upon meeting him, that freedom was in sight for this spirited lady. When I took Berrie to visit chief Kapika in October 2012, I still had no vision of the road before us. I did not, for one moment, think that she would be freed and would be given a chance to live like a real person. Afterwards, back on the deck at my place, Berrie explained to me the symptoms of dementia. It was clear; Ndjinaa had dementia and was very far from being bewitched. We brainstormed throughout that Sunday afternoon. In November 2012, Berrie returned and we went to see chief Kapika about his sister. I was worried that he would take our plans the wrong way, but he completely surprised us and agreed that Berrie could come back and take the chains off Ndjinaa and arrange for caretakers at his Omuramba. Berrie returned on 12 December 2012 and in a very emotional moment, cut the chains from Ndjinaa’s feet. She was given a bath and clean clothes to wear. When she came out from behind the bush, walking upright – my heart jumped – she was human again. Her spirit was set free. On the evening of 31st December 2012, I invited chief Kapika’s village to our campsite here at the Epupa Falls for the yearly party. As the evening progressed and the party got livelier, I took Ndjinaa onto the dance floor. For a few moments the whole village came to their feet, in awe. Ndjinaa was reborn. A moment engraved on my mind. For the first time in a very long time, she eats properly. She sleeps on a mattress and walks with the caretakers. Nobody is scared of her and the children of the village plays around her. Her own children are proud of her. To see her as one of the Omuramba, is incredibly special. Not too long ago, I met up with a famous missionary here in Kaokoland. He knew about Ndjinaa and after I told him her story, he asked me: “What medicine are you giving her?” I smiled and said: “Love and proper care.” He was astonished and could not believe me. Working with dementia in an African culture is a minefield. There are no handbooks to help us on this learning curve. 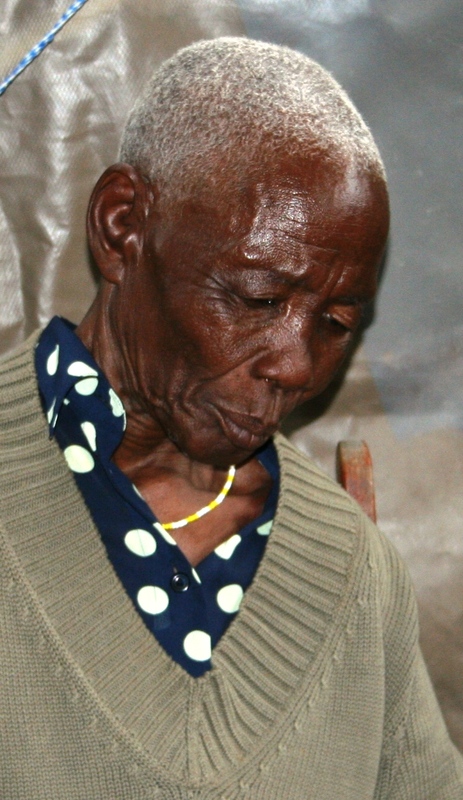 Ndjinaa is the first person to come from the African bush with Alzheimer’s. The first, on my long road here in Kaokoland. I came to love this woman. Through her so many more gates have opened for me. Her story deepens and enriches my life.